RinggitPlus Promotion: Find & compare the best Public Bank Credit Cards in Malaysia. RinggitPlus Promotion: Find & compare the best HSBC Credit Cards in Malaysia. RinggitPlus Malaysia is the country’s leading comparison website. Every day, they help you get more for your money – whether you're applying for a credit card, personal loan or a new insurance plan, planning the best mortgage for your dream house, looking for great discounts from mobile service providers, and much more. Launched in 2013, RinggitPlus has gained a reputation for being the best place to apply for banking products online. In fact, 7 out of 10 Malaysians compare financial products on this site, discovering many deals that can't be found anywhere else on the Internet. Headquartered in Kuala Lumpur, RinggitPlus is one of the several brands owned and operated by FinTech Company Jirnexu Sdn Bhd. They began their journey in 2012 when the company’s co-founders met and realised that they share a mutual passion for giving individuals the financial advice and tools they needed to spend money wisely. They later launched its sister site KreditGoGo.com in 2014 to help consumers in Indonesia save money, too. 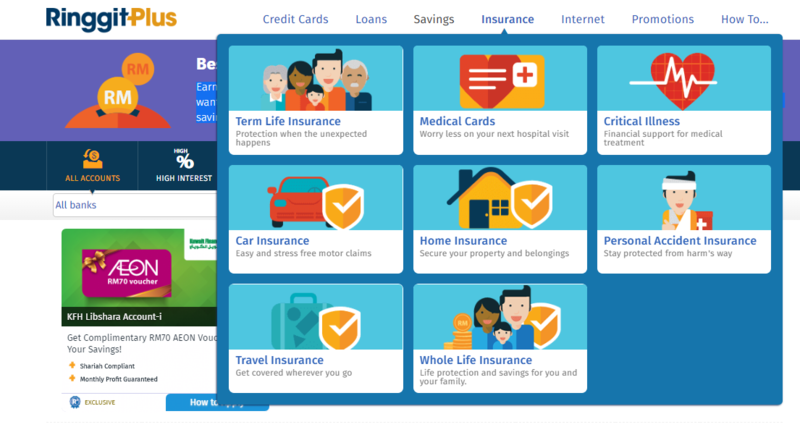 Step 1: On the homepage, browse the category and then select the subcategory to locate your financial product. Step 2: Read up about important information and browse through all available solutions in this category. Compare their features and choose the one that suits you best. Step 3: Add you relevant information where required and confirm if all the terms and conditions meet your requirements. If all is in order, you can apply for your chosen scheme or card directly on the website. Find the credit card that best meets your needs, or simply compare all credit cards from your favourite bank. Click Apply to proceed with the credit card application online, it's easy and convenient. Click on the relevant sub-category under this tab to choose the credit card or debit card best suited for you. In case you are not sure which is the perfect card for you, this site has you covered. Click on the ‘For Your Lifestyle’ tab. Here you will find various options that can describe your lifestyle and spending habits such as a homemaker, entrepreneur or even a lifestyle guru. Choose the description that best suits you. Within each tab you will find the best RinggitPlus credit card that offer maximum benefits for your lifestyle. In this way, you do not have to change your lifestyle but can enjoy maximum savings with your current habits. Whether it is a RinggitPlus personal loan or a car loan, identifying the right deal is critical. Picking a loan with a higher interest rate than you are comfortable can be problematic in the long run. Similarly, leaving yourself very little time to pay off the loan can burden you with financial obligations. Irrespective of the type of loan you require, RinggitPlus HSBC and other offers have you covered. This site allows you to browse through the best loans currently available in Malaysia along with all important terms and conditions. In addition, it also offers a handy calculator allowing you to check various permutations and combinations regarding interest, principal amount and time of repayment for the RinggitPlus home loan and other schemes. Along with term loans, the website also offers solutions for emergency situations. In certain cases, waiting for an application can be a nightmare. For those that require instant funds, RinggitPlus also offers quick loans in under 24 hours. This dedicated section allows you to quickly scan the best offers and apply online instantly for a loan. Even a little saving over a long time can result in a lot. Having the right savings account can help you access your hard-earned money while also offering you maximum interest for added earnings. With the right savings accounts, you can earn interest on your savings account no matter how much you have deposited, withdraw your cash whenever you want, and enjoy peace of mind knowing your money is working for you all day, every day. 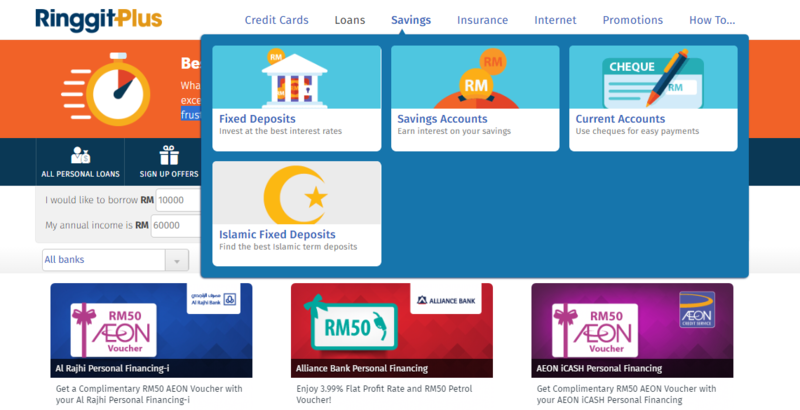 Get all the benefits of the best savings accounts in Malaysia, simply at the click of a button. Along with savings, investments are critical too. You worked hard for your money, so make your money work hard for you. Compare RinggitPlus Fixed Deposit accounts for the best interest rates or FD promos with great gifts and best return on your savings. Grow your wealth at low risks and guaranteed high profit. Best Term Life Insurance Policies in Malaysia: Life is very uncertain as anything can happen. Always protect the people that matter most by providing coverage for you and your family. Best Medical Cards In Malaysia: Don't let expensive hospital fees stop you from receiving the medical treatment you deserve. Ease your burden with a medical card that pays 100% of your medical bills. Have the convenience of cashless admissions and outpatient benefits at both government and private hospitals. Best Critical Illness Insurance in Malaysia: Don't be caught off guard when your regular health check-up returns a diagnosis for a severe medical condition such as cancer, diabetes, or kidney disease. With a Critical Illness Insurance policy you'll receive lump sum payments to help you through your treatment and recovery for 36 critical illnesses. Best Comprehensive Car Insurance Coverage in Malaysia: Owning a car is not a luxury, how else will you get to work, drop the kids at school, see the family and get the shopping done? It's better to protect your transport by getting your vehicle insured against accidents, theft, and fire. Enjoy 24-hour roadside assistance and towing services! The right RinggitPlus credit card promotion can offer you great insurance coverage and an exceptional RinggitPlus car loan. Best Home Insurance in Malaysia: Compare all home insurance and protection plans to get the right amount of cover and best premiums quotes for both your house and home contents! Best Personal Accident Insurance in Malaysia: Call it bad luck if you may, but a major personal injury or bad car accident will cost you expensive hospital bills and recovery time. Get the best online PA insurance policy with a few clicks and get coverage for untimely accidents at home, on the road and in the workplace. Best Travel Insurance in Malaysia: Travel can be a risky business so why take a chance? Get some insurance! With benefits ranging from 24-hour emergency cover to compensation for loss of luggage and flight delays, enjoy your holiday stress-free with a great value travel insurance plan. Best Whole Life Insurance Policies in Malaysia: Protect yourself and your family with an insurance plan that provides coverage for the uncertainties of life. Compare all life insurance plans to get the best deal and the best protection. Finding maximum speed and bandwidth and a reasonable price can be exhausting with so many networks to choose from whether it is for work, streaming movies or getting lost in the latest video game, a good internet connection has become a necessity in every household. RinggitPlus promotion deals helps you navigate through the confusion and pick your perfect plan with its instant comparison. Best Fibre and ADSL Plans in Malaysia: From fast video streaming to smooth internet browsing, a high speed Internet plan is a worthwhile investment. Have greater access to information and share ideas online with ease wherever you are in your home. Best Mobile Broadband Plans in Malaysia: Stay connected wherever you are with wide 4G coverage from the best internet service providers in Malaysia. Get your own portable MiFi modem so you won’t have to bother cafe hopping ever again just for an unreliable WiFi hotspot! Best Smartphone Postpaid Plans in Malaysia: Stay connected with the best iPhone, Android, Blackberry or Windows Phone. Compare phone prices and bundle it together with a mobile plan with unlimited internet for faster 3G and 4G LTE. Discover the best promotions, cashback offers and deals in Malaysia. Select your bank and your region, then pick promotions you like, creating a list to review later. With so many promotions to choose from it's simple to save money. You can sort the promotion offers using the following filters to easily search for your preferred promotion category. Click on the RinggitPlus promotion one you like to read about any important terms and conditions that may be applicable to redeem the offer. Step 1: Visit the ShopBack website and click on the RinggitPlus store at the bottom of the homepage. You can also use the search box to find the link to the store. Step 3: Look for the latest RinggitPlus promotion in the voucher codes, discount codes and coupons section. Step 4: You will be redirected to the RinggitPlus website to browse and apply for the deals. Step 5: Click ‘Apply Now’ and receive RM 200 cashback credited into your ShopBack account upon approval. In case you have any queries or concerns, you can easily connect with the customer care team at RinggitPlus via the following methods. The team is available from Monday to Friday 10:00 am to 7:00 pm. In addition, you can also follow the brand on social media for latest RinggitPlus personal loan deals and other promotion offers.